The best thing about a declining stock market is that we can gobble up some awesome discounts on many great companies. Market corrections are a fantastic time to buy additional shares of stock at a huge discount – especially those that pay a dividend. Personally, I don’t get caught up watching the value of my stocks decline. Instead, as the market moves up and down, I prefer to focus on future dividend income estimates. Despite the direction the market is moving, solid companies will continue to reward their shareholders through dividends. Future dividend income growth can come from 3 different areas. First, anytime a company that we own in the Money Sprout Index raises its annual dividend, our 12 month dividends increase. With almost 30 stocks in the Money Sprout Index, this almost certainly happens each month. Next, anytime we buy new shares of stock – our future dividend income increases. More invested dollars equals higher future dividend income. 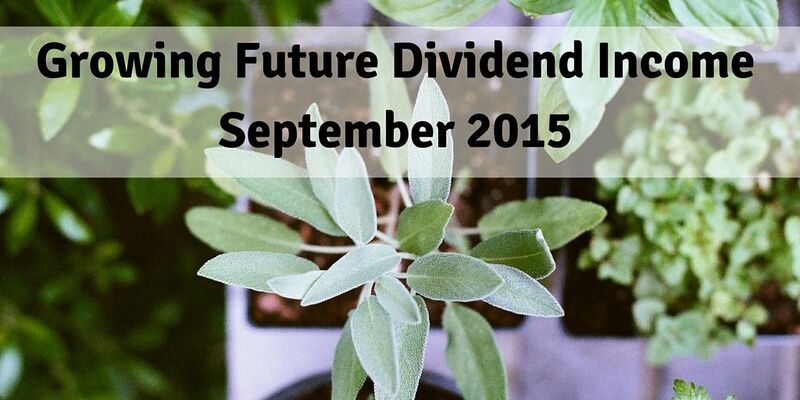 Finally, anytime dividends are reinvested through DRiP, our future dividend income goes up. About 50% of the stocks we own take advantage of DRiP. There is nothing guaranteed about future dividend income from the companies that we own. However, since we are investing in top dividend paying companies, there is a very strong probability our future dividend income will continue to grow. Here are the first six 12 month forward dividend income results that I have previously published. My wife and I have a goal to earn a minimum of $2,000 in dividend income in 2016. These monthly updates have helped us see how our future income numbers are growing and what type of new capital we need to keep moving into the market. Our future dividend income has grown every month since we started reporting our results. Our growth between August and September continued that trend. At the time of this writing, our future dividend income has risen by another $40.75 since last reporting our numbers in August. The stock market continues it’s correction but the awesome thing is that our future dividend income continues to rise. Despite lots of uncertainty in the market, our dividend paying stocks continue to give us a raise. Provided the underlying business is still in good shape, there is never a better time to add money to the market then when stocks are cheap. We plan to continue adding more and more capital into the stock market as allows during this downturn. There is never any guarantee that we will earn $1,639.08 in dividend over the next 12 months. However, we like our chances of earning at least that amount – if not more. This is because of the rock solid companies that we have decided to invest our money in. All of the companies that we have purchased have a strong history of annual dividend increases. We are confident in future dividends, but even if one company were to freeze or even cut their dividend, there are several others to make up the difference. What stocks are you buying during this market downturn? Are you taking advantage of a cheap stock market to build your portfolio?